It appears more employee unrest is trickling through Apple’s tech utopia — and it’s the same old song. Complaints of overcrowded buses, undesirable food and lack of water have surfaced out of a Jundiai, Brazil Foxconn plant, where workers have threatened to strike unless conditions improve by May 3. According to Brazil’s TechGuru, over 2,500 factory employees assembled in unity before handing an ultimatum to Foxconn. 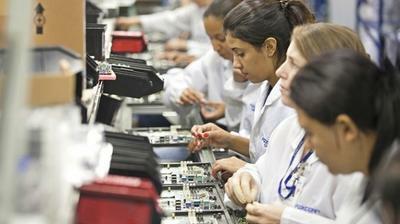 The root of the problem, AppleInsider said, is factory floors are becoming much too crowded. Foxconn reportedly hired over a thousand employees recently — a factor that is contributing to a more chaotic and unorganized workplace. The Cupertino company only recently started selling its iPhone 4 in Brazil, which was cited as a key growth region by Apple CEO Tim Cook, and it has received approval to begin selling the iPad 2, AppleInsider said. TechGuru didn’t say which products specifically the workers are assembling, but officials claim the situation will reach an amicable conclusion before a strike occurs.